5#’s of different styles of Sausages that you helped make and get to take home. We will focus on grinding the meat, mixing the meat and stuffing the meat. We will also discus cooking methods and all the vital steps that go into a properly emulsified Sausage. There will be Chicharrones and beverages available during the class. The 3 hour class will start promptly at 10 am. Aprons, towels and a knife per person will be supplied during the class. If you have a knife or knives you are comfortable with and love to use, please bring them with you. We will be in a professional kitchen so please wear flat shoes and the appropriate attire. Full participation is recommended, if you only want to watch and ask questions you are welcome too. RSVP here. Come with questions and prepared to get dirty! The Sausage making class will be followed by a Whole Pig Butcher Class starting at 3 pm, details below. 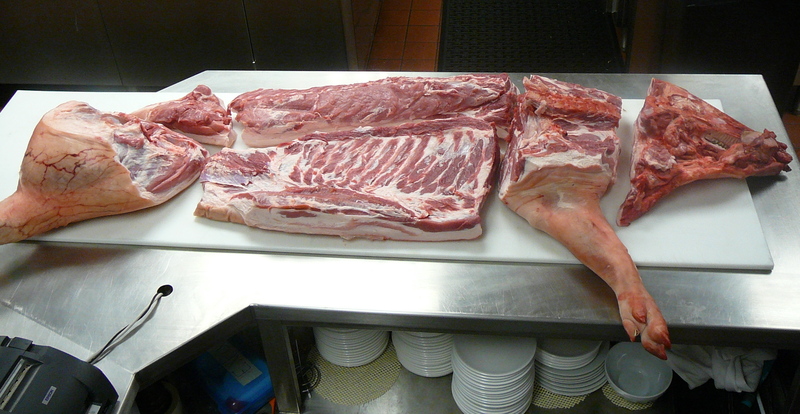 7-8# of pig that is yours to take home and you helped butcher. The 3 hour class will start promptly at 3 pm. There will be Chicharrones, carnitas and beverages available during the class. Aprons, towels and a knife per person will be supplied during the class. If you have a knife or knives you are comfortable with and love to use, please bring them with you. We will be in a professional kitchen so please wear flat shoes and the appropriate attire. Full participation is recommended, if you only want to watch and ask questions you are welcome too. RSVP here. Come with questions and prepared to get dirty! ahhh, you are sold out…. when is the next class, thank you. when is the next class?? thanks. would love to attend the next class.